Populous II: Trials of the Olympian Gods is a great sequel to one of the most unique computer games ever made. It was unfortunately not as successful, although every aspect of the game has been improved and various gameplay features added to make it a deeper experience. 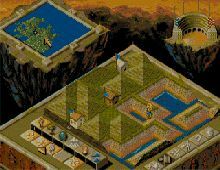 In contrast to the nameless deity you play in the original Populous, in the sequel you're very much part of the scene – the son or daughter of Zeus, no less. Your task is to win a place for yourself in the pantheon by getting your worshippers to take on and beat the followers of the other gods. All in a day's work. That Populous II isn't just a prettier Populous is obvious from the start: different points can be allocated to different elements to make your character more or less powerful in that area. For example, if you want your god to be a fire god (handy when fighting Neptune), you can give him/her more points in "fire" element. You will then get powerful fire effects (e.g. meteor shower and volcano) to wreak havoc on your opponents' followers much quicker than afforded by the other elements. Your powers, as in Populous are what makes the game a lot of fun: in addition to old favorites such as tidal waves and volcanos, there are many more creative ones such as baptismal fonts which turn enemies into followers (on the downside, these converts can change back into the enemies when they fall into it the second time!) The bigger the effect, the more mana you must have. Mana comes from your followers: the more followers you have, the more mana they give you. If you have enough mana, you can also summon famous Greek heroes such as Perseus and Theseus to help rally the people – and burn down enemy houses in a hurry. The great fun in Populous II is the little tricks you will learn as you play. If the enemy is on a holy pilgrimage, for example, rather than trying to kill them directly you can plant a swamp in their way and watch them march to their deaths. You can plant trees all throughout the enemy land and then throw a match to it and watch an entire enemy city burn in one giant conflagration. Planning, timing, and dexterity are all required for success, as well as quick anticipation of your enemy's strategy. Each of your opponents is introduced before the battle begins, and they do follow their legendary traits (e.g. if you fight Neptune, expect to see a lot of water effects) so playing the game is also a good way to bone up on your Greek mythology :) To round off this gem, there are random maps, multiplayer options, and a practice mode where you can learn the game's mechanics. Even today, you won't likely find a better god game anywhere. Highly recommended!